Merriam-Webster’s Collegiate Dictionary defines embroidery and tattoo as above. Both procedures are a similar process, the use of needles to thread string or ink into a material. On a cultural point of view, however, their significances hardly share a common ground. Well, except Sherri Wood‘s concept. Wood, an embroidery artist, intertwined these separate needle twins, and started Tattoo Baby Doll Project, currently exhibited as Contemporary Needlework: Tattoo! at Museum of Craft and Folk Art. Tattoo Baby Doll Project is the collaborative work of Wood and 14 female tattoo artists. Wood first sent out cloth-based vintage dolls to the tattoo artists across the country. 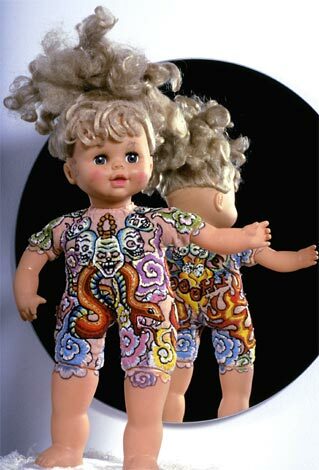 Each artist then designed a tattoo for the doll, drawing her own expression onto the doll’s body. The finished pieces were sent back to Wood. This time Wood herself embroidered the tattoo designs on the dolls. The results are ‘new breeds’ conceived by needles, a composite of embroidery and tattoo that encourage the viewers to shift their paradigms to the new. 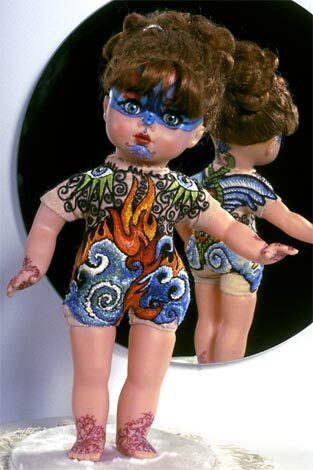 The doll project began in 1998 when North Carolina based embroidery artist Wood discovered the unseen analogy in tattoo trends seen on the streets of San Francisco. Juggling the contrast between traditional feminine nature of needlework and contemporary tattooist’s outspoken expression, Wood explores multi-layers of today’s female identity issues as well.